Saw the cutest toddler photo the other day with the header: “Silence is golden… unless you have a toddler… then silence very very suspicious.” Funny as the statement is (it’s funny because it’s true) It gave me pause when I thought about how this might apply to interactions between a dog and child – the truth is, a child should NEVER be left alone with a dog, even for a short moment. And yet, in many households, this could be a tall order at times. Our daughter, for instance, has learned to open my husband’s dog’s crate. It is the type of door with the turning knob instead of the traditional stiff spring pins. I used to think that Shadow’s crate was the best ever, but I’m not so happy with it now, and we’re actually considering getting another of the less expensive type that a 2-year-old can’t open. The good news for us is that Shadow is our “good dog”, who is least likely to get irritated by her; he really does appear to like her, seeking her out and kissing her face. Nevertheless, unsupervised visits with him are forbidden, so my ears have become attuned to the sound of a crate door opening. As much as I prefer to live with loose dogs in the house all the time, crates really are the best resting place for dogs in a house with a loose toddler. In the crates, the dogs are actually safer themselves as well, since a toddler can’t accidentally jump on them, try to ride one “like it’s a small horse”, or otherwise annoy them. It’s the best option when I need the dogs inside but can’t be supervising 100% with the toddler. When I do have to leave the room and a dog is loose with our daughter, I will always call the dog to join me. While it is not usually my preference, I’ve found that it is often MUCH easier to recall a well-trained dog than even the best trained toddler. 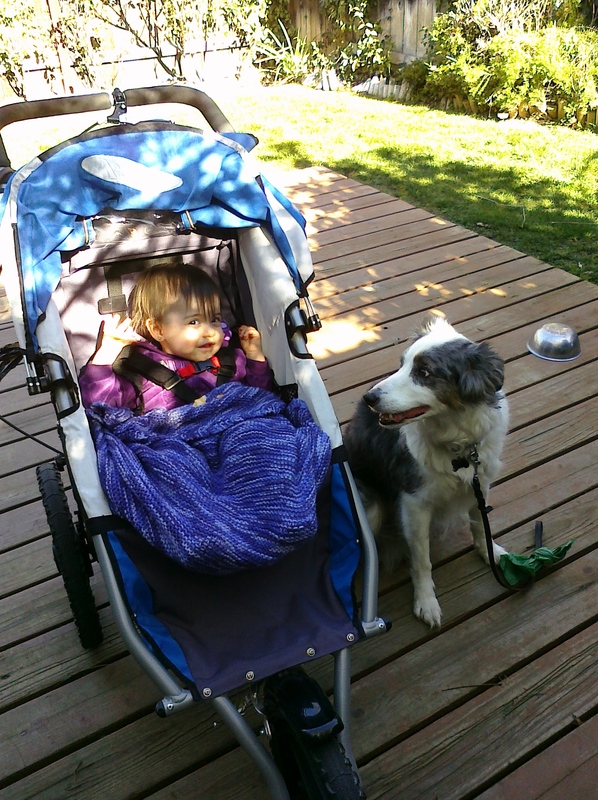 Usually, when the dog joins me so does the toddler, which makes things even easier. The point is to keep an eye on them both. Having dogs and children together is not always fun and games. It is often more work than one would expect. But the rewards are worthwhile for those of us who love dogs and want our children to grow up with the joys of having them in their lives. Anyone who knows me understand that I am a runner. Not a jogger, nor a “fitness buff”, but a runner. It is something that courses in my blood, and that I myself don’t even fully understand. What I do know is that I crave the run, and I am not a particularly pleasant person to be around if I haven’t had a run for several days. Naturally, my dogs are also runners. When I was 6 months pregnant, I had to stop running due to a high risk pregnancy, and it not only depressed me, but threw my dogs for a loop as well. My border collie gained 4 pounds in that time and I was relieved for both of us when I was finally given the thumbs up to resume running. Now I’m fortunate that I get to run on a regular basis, but my entire process has changed since before the baby. Whereas I used to just put on my running shoes, stretch a bit, then leash my dog and go, now the process is much more complicated. After dressing myself and stretching, I get to prepare the stroller, make sure that I have milk and juice and goldfish crackers or some similar snack. Then I thoroughly sunscreen the kid, make sure she is fully dressed, including shoes, and strap her into the stroller. Then I put on the belt strap and leash up the dog as well as the stroller, so that neither will accidentally run off, nor get me a citation (off-leash dogs aren’t legal around her, after all.) After one last double check to make sure I have everything I need, I’m off. The runs are still as much fun as they always have been, but they are different. No longer can I duck under a barrier to get to the other side of a trail. For that matter, narrow trails are pretty much off-limits entirely with the big stroller, as is deep mud. And rainy day runs are mostly a thing of the past. I play “find the window of sunlight” and hope for clear skies so that my child and the stroller may stay dry. The dogs never care if they get wet, but the kid is a different story. As for the dogs, they don’t seem to mind the change at all. 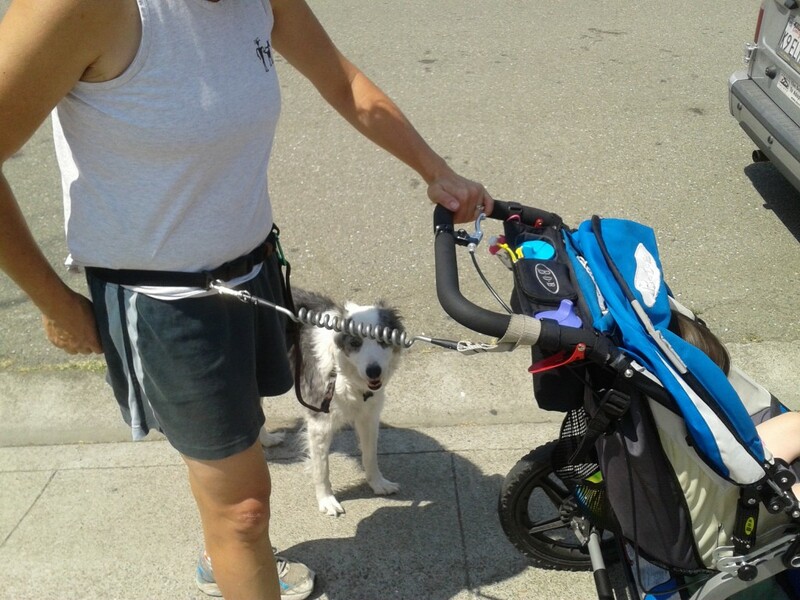 They do great on the waist-attached leashes, and quickly learned to run alongside the stroller without cutting in front of it. If they need to switch sides, they do so behind me. They are also getting very good at their left and right turn cues (yes, dogs can learn directions) which I use to keep from running them over when turning the stroller right next to them. My girls, ready to go! As for me, I’ll always be a runner at heart, and regardless of the running partners, my morning runs will always be my favorite part of the day. With my daughter, I instantly had to triple the equipment that I took to tournaments and competitions. With four dogs, I took 2 bags of gear and three crates. Adding Shelby meant two more bags of gear plus another chair, plus a cooler full of food and milk, plus the stroller, plus plenty of toys and books… Just going to grandma’s house feels like I’m going away for the weekend, and so a tourney becomes a huge production. But, I would not trade it for the world. 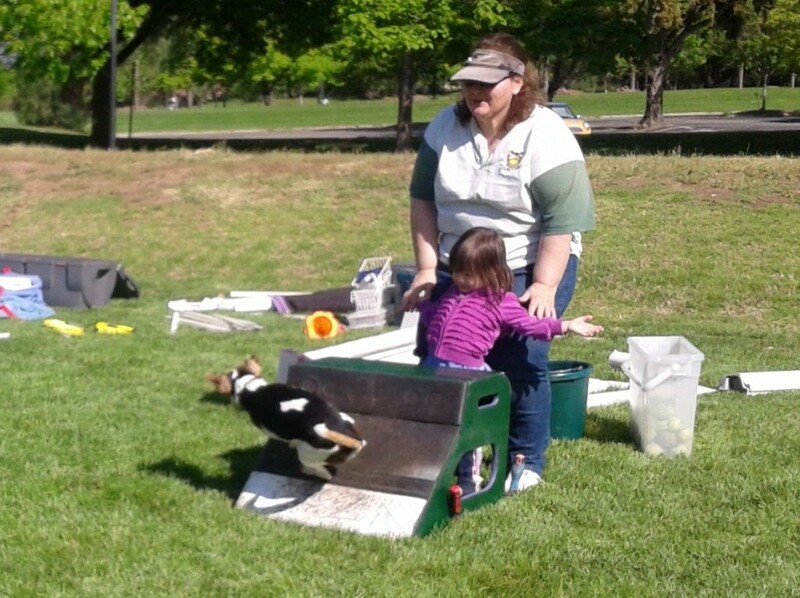 Learning to load the flyball box for our smaller team dogs. Shelby is becoming a natural around the dogs. 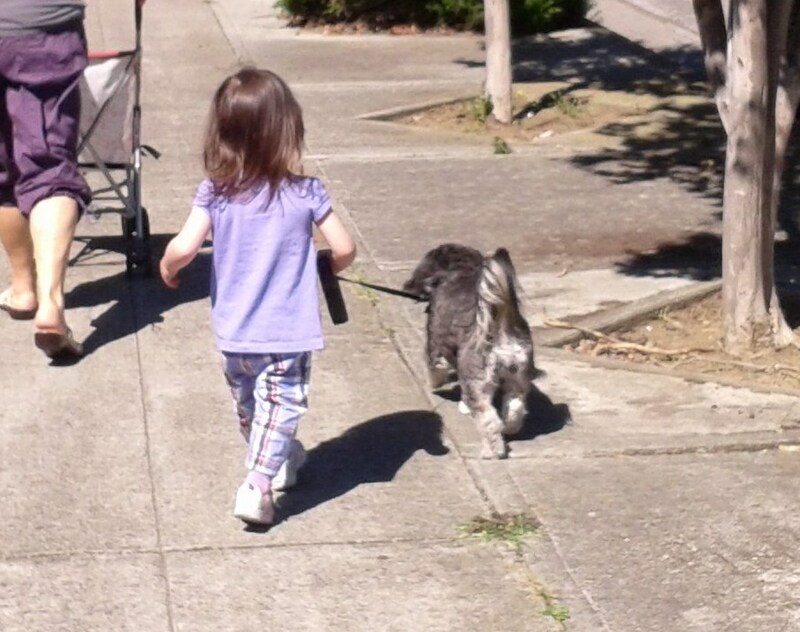 Under our very close guidance, she is learning not to approach any dog without asking first us, then the dog’s owners. I know the dogs on our team well, and so I know which are OK for her to pet, and which she must steer clear of, and she is getting very good about heeding my requests. Yet, it’s not all about relaxing and having fun. There is also the chasing. Not surprisingly, like me and my dogs, Shelby also likes to run… correction… she loves to run. Thus, going to flyball tournaments or agility trials or any dog event with her involves chasing her around, making sure that she does not run up to or past other people’s dogs. 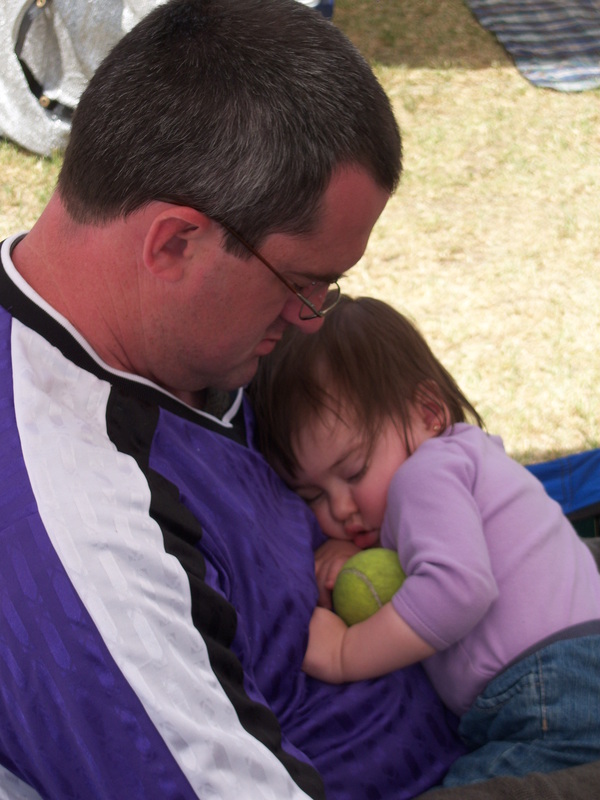 It can be exhausting, particularly for my husband, who gets to do most of the chasing while I am competing. Eventually, she will get to run her own dog in competitions, but until then, we get to chase her around to keep her safe. Yet I still would not trade it for anything. Shelby is learning so many valuable lessons at the competitions. In addition to shagging balls and holding our dogs’ leashes, she is getting good outdoor exercise while learning patience, politeness, sportsmanship, social skills, asking permission, helping out around camp … More significantly, she gets to see firsthand how beautiful working relationships can be between people and dogs. So even if she chooses not to participate in dog sports when she gets older, she will understand good human-dog relationships, and hopefully seek to have them herself. Yes, it is a different upbringing than the average “soccer kid”, but it offers a nice balance that will hopefully have long-term, positive effects on her, and on all of the “junior handlers” that we cheer on in the lanes. Did I mention that I would not trade it for the world? I was chatting with a friend the other day, and we came to the topic of what we would or would not want to do in front of our children. At my home, I’m fortunate that my husband and I do not have a lot of “bad habits” that we wouldn’t want our daughter to pick up. Nevertheless, we still have to be mindful of certain things, such as our language, or a decision to run across the street to grab something out of the car. When it comes to interactions with our dogs, (as well as our cats), we really do find that we have to watch ourselves. For instance, I love kissing my dog, Claire, on the face. 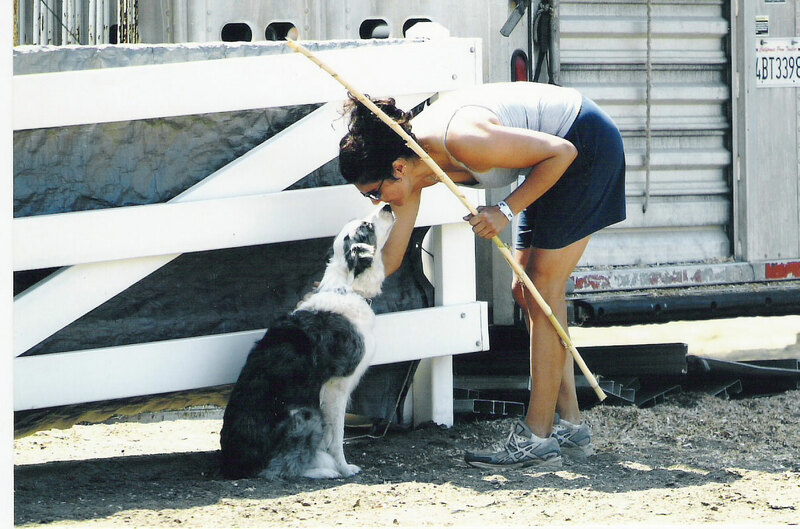 My favorite photograph of the two of us was taken right before our first sheep herding trial. I was a nervous wreck, and bent down to kiss her on the nose, while she gently licked my chin. It was a magical moment, but not one that I’d like to see our two-year-old daughter try to emulate until she’s substantially older, and can understand when a dog is OK with this and when it is not. 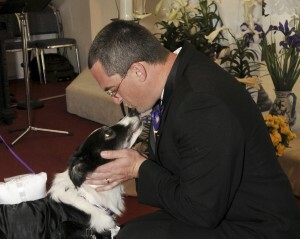 My husband kissing his dog at our wedding. 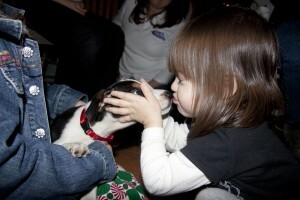 I was not present when my daughter kissed this puppy, but I would have discouraged it, in spite of his young age. Unfortunately, sometimes other people don’t share this understanding and they encourage children to kiss dogs on or about the face. I wrote a couple of weeks ago about the “curse of the good dog” and this can add to the challenges, as “good” dogs often let children get away with things that they should never do to dogs. And thus, people often grow even more complacent. Grooming – my Pyrenean Shepherd, in particular, requires a great deal of grooming to keep his coat from becoming matted. I used to love to groom him in the evenings while watching television. Now, I must wait until after our daughter is in bed (which is usually a time I reserve for working) or have him groomed professionally in order to keep him comfortable. 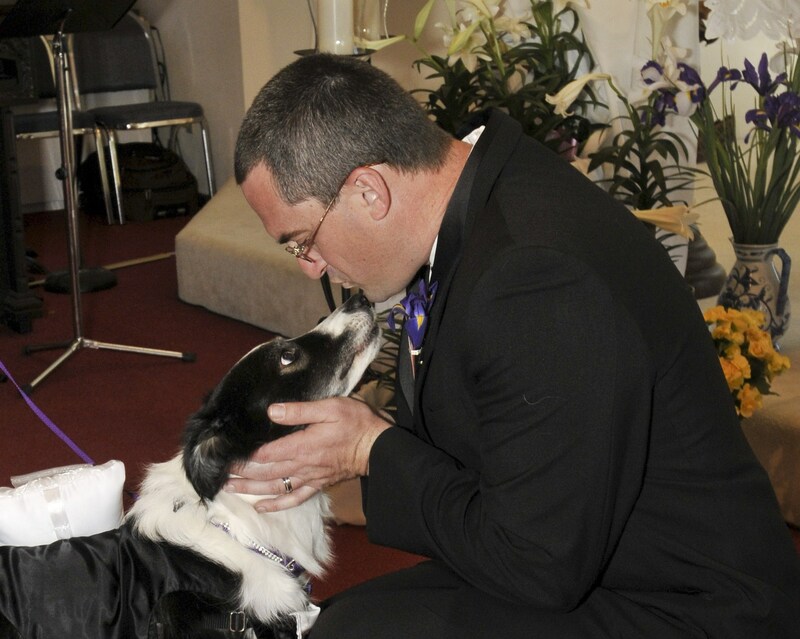 Face kisses – Let’s face it, so many of us love to kiss our dogs on the face. It is a way for us to show affection, but it is not something that children should be doing, as they are unable to understand when a dog has had enough, which could result in terrible consequences. (For that matter, I have seen adults bitten by dogs in this way as well.) It’s just not worth the risk, so children should be prohibited from ever trying it. Snuggling – like face kisses, a child runs the risk of missing important social cues from a dog. Furthermore, children are naturally clumsy, and a well-meaning toddler may accidentally fall upon or step on a dog in an attempt to cuddle, resulting in an injured and/or very angry dog deciding to defend itself. Unfortunately, not everything can be hidden from the kids. Following are things that I do not allow my daughter to do, but which she must sometimes witness. In every instance, I remind her that she is not to do this and that it is a “grownups only” activity. Tug game – my daughter joins me at flyball and agility practice sessions, as well as competitions, so she sees me playing tug with my dogs all the time. She often asks for my end of the tug toy to play with, and I always decline to give it to her, telling her that it’s a game for just mommy and the dog. Then I hand her a ball to toss for the dog if we are someplace where this is appropriate. Drop it cue – this important cue can come up at any time, and often must be addressed in the moment. My dogs all have highly reinforced “drop it” cues, and I continue to reward them for drop its in order to keep this behavior strong. But whenever my daughter is present and I have to take something from a dog, I remind her that *only mommy or daddy* can do these things. 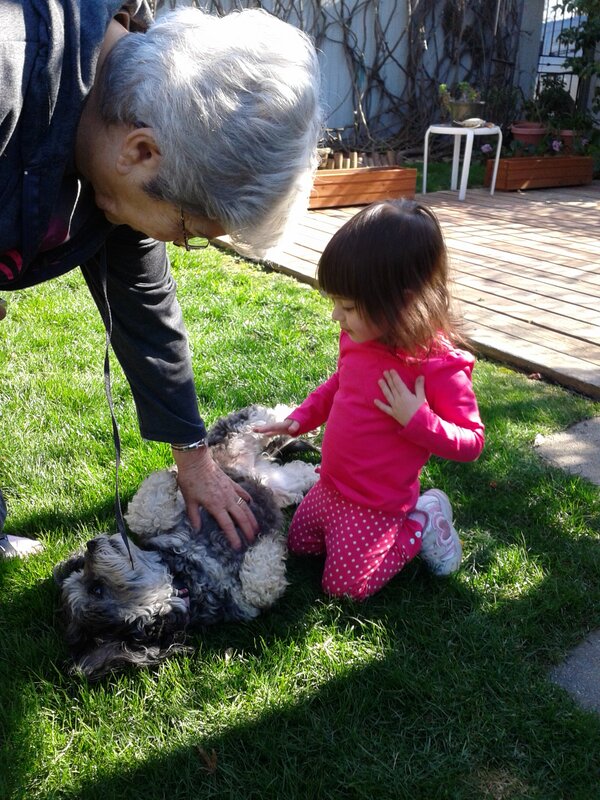 Running around the dogs – In child-dog safety seminars, I teach children “don’t run by a dog, be a tree or a log.” However, I run with my dogs all the time in flyball and agility, as well as on my daily exercise runs. This is a tough one, but I explain to her that if the dog is not already running alongside her, then she must not run past it. Again, this takes a lot of management, but the potential alternative is not worth the risk. There are other interactions which come up as safety concerns, but these are the principal issues that I see on a regular basis. Of course, our daughter will not be unsupervised with our dogs, so that I may watch her every move to make sure she learns what is and is not allowed with them. But, like every parent, there will come a time when I will have to let go, and trust her to have learned. Meanwhile, I will continue to emphasize the rules of safety and hope and pray that they really stick.